Biomechanic John Lloyd, PhD, reviewing tissue properties and the laws of physics with Tonya Sadowsky at the 2012 EBMSI conference. Two exciting conferences are coming up this summer and fall, one for people who want to understand more about the troubling diagnosis of infant abusive head trauma, and another for professionals eager to witness the evolving debate. The Evidence Based Medicine and Social Investigtion group (EBMSI), which is hosting the August conference, is a remarkable organization to begin with, a coalition of families who have weathered abuse allegations and are now offering help to the newly accused. With an expanding circle of volunteers and supporters, founders Zabeth and Paul Bayne are holding their third conference this summer, August 2–4 in Surrey, British Columbia. Zabeth and Bethany Bayne, August 2012. Zabeth and her husband were accused of shaking Bethany when she was just a few weeks old. The parents reported one of her older brothers had fallen on her. The conference is intended both for accused families and for professionals and paraprofessionals who work with child abuse cases. The 2013 faculty includes published experts and front-line practitioners in the arena. The setting is intimate, and the schedule provides time for consultation with the speakers. Last year I posted summaries of the talks by forensic pathologist Dr. John Plunkett and attorney Zachary Bravos at EBMSI. Other speakers this year include pediatric neuroradiologist Dr. Pat Barnes—who testified for the prosecution in the Louise Woodward case but has since revised his opinion—and pediatric bone expert Dr. Charles Hyman. 2015 update: The conference information is no longer on line. 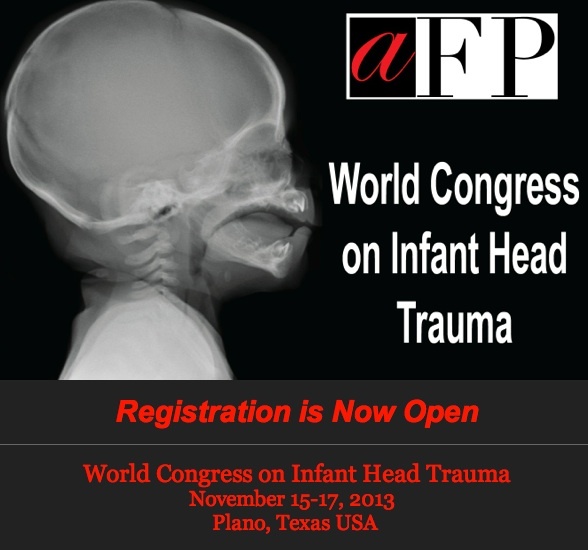 A group of forensic pathologists, meanwhile, is attempting to move the debate forward with a “World Congress on Infant Head Trauma,” November 15–17, at the Center for American and International Law in Plano, Texas. The conference features a series of presentations and responses by each of two teams, whose specific positions are not articulated in the conference publicity. One team is headed by forensic pathologist Dr. Greg Schmunk, the other by forensic pathologist Dr. John Plunkett. Speakers will submit both written and oral arguments, and an editorial board will publish a summary of the dialog in 2014. Dr. Chris Milroy will act as conference director and editor-in-chief of the published proceedings. Exciting times in the arena. 2015 update: The World Congress web site is no longer up, and I’ve not heard anything yet about a published proceedings. If you are not familiar with the professional debate surrounding shaken baby syndrome, please see the home page of this blog. It seems like the November conference is asking the wrong question. Shouldn’t they be asking if the classic triad of symptoms proves the child was shaken? Excellent point. That’s what matters in court.